Mexican authorities said Thursday they had found 21 bodies on the US-Mexican border after a drug-gang shootout in a town near where President Donald Trump visited later in the day. 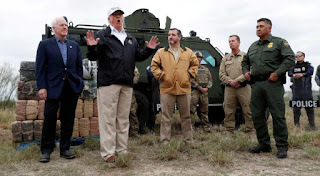 The bodies -- some of them badly burned -- were found Wednesday in the border town of Miguel Aleman, about 170 miles (270 kilometres) from McAllen, Texas, the city Trump was due to visit as he continues his push to build his long-sought border wall. "Some of them were burned. Seven vehicles were also located... It was a confrontation between two rival groups that are involved in a turf war over drug-trafficking routes." Mexico has been racked by drug-related violence in recent years -- something Trump has alluded to in arguing his wall is needed to keep out violent criminals and narcotics. McAllen, where he was meeting with border patrol agents, sits across from Tamaulipas. The US State Department has issued its most severe travel warning for the state because of violent crime, classifying it alongside countries such as Iraq and Afghanistan.